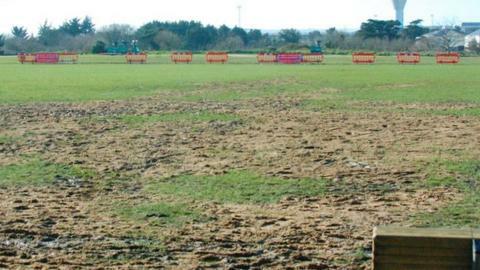 Jersey's Championship clash with Nottingham was postponed an hour before kick off after the visitors raised questions about the state of the pitch. The game had been set to be played on a training pitch because the main St Peter ground was ruled out earlier in the week. The referee's inspection on Friday afternoon approved the switch. But just before 14:00 GMT, with no further rain and in bright sunshine, the game was called off. "A lot of credit to Jersey Rugby Club because they put a lot of effort into trying to stage this game," said Nottingham head coach Martin Haag. "I think it was absolutely the right decision from the referee in the end. He waited as long as he possibly could. "There are a number of areas on the pitch that are in excellent condition but there are a number where you just can't play rugby on." Nottingham will now face a second trip to the island and the accommodation and travel costs that come with that. Jersey's director of rugby Ben Harvey was far from pleased at the postponement and said it was a "very surprising" decision. "We wanted to play the game. The Nottingham captain didn't want to play the game," Harvey told BBC Radio Jersey. "There were a couple of contentious issues on the pitch but in the referee's words 99% of the pitch was absolutely fine. "We don't really understand why Nottingham didn't want to play." No date for the rearranged match has yet been set although Jersey's chairman Bill Dempsey hinted that Saturday 16 March might be the next available date. Meanwhile, Jersey's relegation-rivals Doncaster Knights won 23-17 against Leeds Carnegie to narrow the gap at the bottom of the Championship to just one point, although the islanders now have a game a hand.